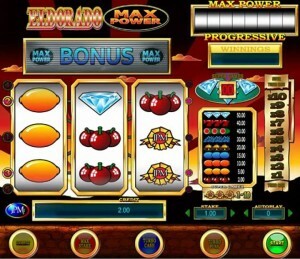 Eldorado Max Power is a classic title that comes from Microgaming. Though the layout looks slightly different than those that you might be used to, what you get in the end is still a game with only 3 reels and a limited number of paylines, with classic looking icons and for the most part a lack of features. Fortunately, a progressive jackpot is also available, so there are some things that this game does very well. This is a classic slot machine, which offers 3 reels and 5 lines. The game’s top reward is its progressive jackpot, while the regular features are only represented by something called Turbo Cash, which is mostly a way to gamble with your winnings. The feature section in Eldorado Max Power is not very developed, and if you discount the gambling related parts you don’t actually get anything from the game. You will find on the far right part of the screen a Turbo Cash mode which you access when you have winning combinations. The alternative is to use the Collect button, which will simply give you your money. Turbo Cash will allow you to gamble a bit with it, in the hopes of getting bigger prizes, up to 10x more. There are no regular features to be had in this game. You will get three reels with classic icons, but without wilds or scatters to make things truly interesting. The way to get the progressive jackpot is through a Max Power icon that takes over an entire line. You get access to a bonus feature in that case, and you can win the progressive jackpot mentioned at the top. As for the Super Games, which are mentioned above the paytable, you need three JPM Logo symbols to form a combo, and you get 1 to 10 such rounds. The game has 5 reels that are part of it, and you can play with all of them active, the only requirement being to place a bet, which is for all of them. The Stake section, in the bottom right part, is the one you will use. The rewards offered by the game aren’t terribly impressive, but you can get up to 50 times the bet from them. The better target would be the Max Power progressive jackpot. The game doesn’t exactly have a fixed theme here, but the symbols are classic ones, which have been part of countless 3 reel slot machines in the past. You have diamonds in there, a JPM logo, bells and all kind of fruit icons. None of them look particularly impressive unfortunately, but thanks to the many details found in the surrounding graphics and the background, at least you’re not feeling like you’re playing a true classic title. Symbols: Diamond (50x), Red Seven (40x), Watermelon (40x), Grapes (30x), Bells (20x), Plums (15x), Orange (10x), Lemon (5x) and Cherries (2x). It doesn’t play like a regular classic slot machine, it has a progressive jackpot and it doesn’t have any typical features. If those all sound like pluses to you, give it a chance. 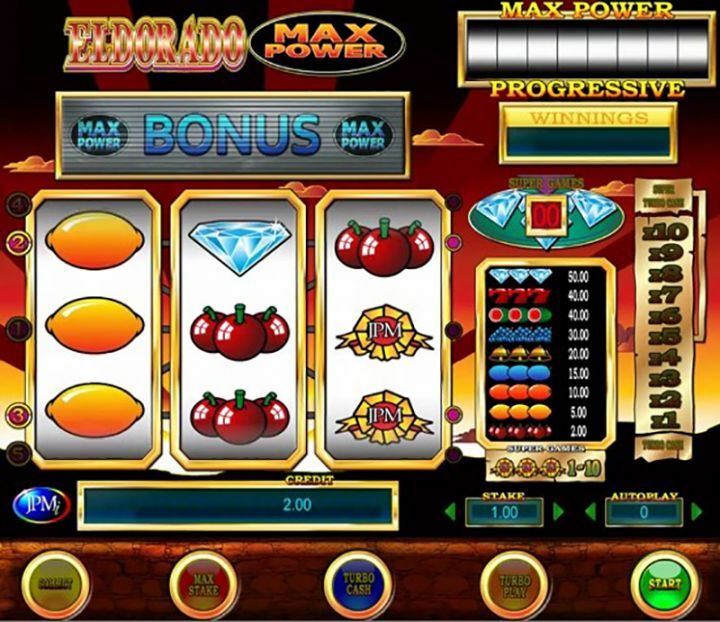 Eldorado Max Power can be found at any Microgaming casino, where you get a chance to play it for real money or in free mode.